A jackknifed semi on the inbound Dan Ryan Expressway near 63rd Street closed all local lanes for nearly three hours early Wednesday morning. 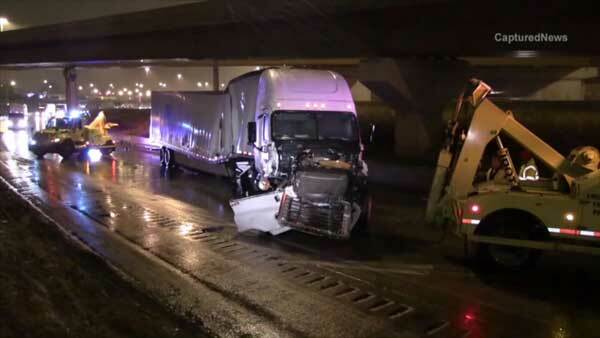 CHICAGO (WLS) -- A semi jackknifed on the inbound Dan Ryan Expressway near 63rd Street and closed all local lanes for nearly three hours early Wednesday morning. Illinois State Police said the truck crashed around 3:15 a.m. The cab split open and the trailer was damaged. The semi was carrying a non-flammable liquid, which spilled onto the road. Crews closed all local lanes to clean up the hazardous material. All local lanes on the inbound Dan Ryan were back open by around 6 a.m.
State police said the driver suffered "minor injuries," but was not taken to the hospital.